This unique book covers FM broadcast stations in North America. Maps are included for each state (and Canadian province) showing station call and location. You can also learn call letters, city of license, format, coverage, stereo capability, SCA and even translator information. It also includes station listings by location and frequency. ©2005 20th Edition. 264 pages. 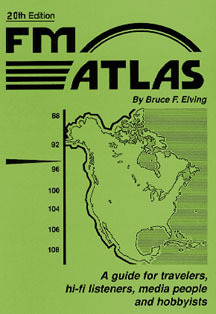 FM Atlas Publications. This informative book will be included FREE with your purchase of a Tivoli PAL from Universal Radio for a limited time.